June 16, 2010 · 2:09 am.06. Although a noble attempt to regenerate kids' interest in baseball cards, the Topps Attax game could very well repel an entire generation. Let the record show that the baseball card hobby amongst children is already dead, victimized by foolish price inflation, holograms ($3 for 6-card packs, REALLY?) and some crappy toys called Bakugan. Because I’m a sucker for hopeless causes, I was delighted to see Topps make an effort to make baseball cards fun again instead of creating the illusion of investment. I was thrilled to see the Topps Attax game at Target and hoped it might generate some enthusiasm with my eight-year-old son. Here’s some advice. Instead of buying the starter set and playmat, take your five bucks to the nearest bank and convert it to quarters. Then take the coins and keep feeding the nearest parking meter until your hands are empty. Because watching those meter numbers go up is a gazillion times more enjoyable than this pitiful game. 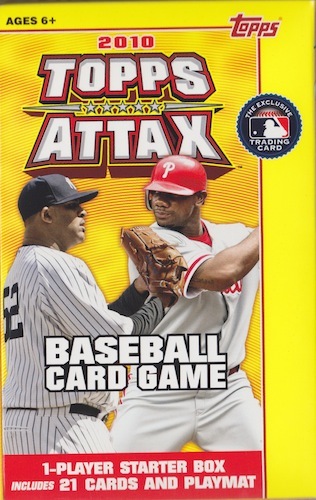 Essentially, Attax is like playing “War” with a regular deck of cards with no relevance to real baseball. The hitting team randomly flips over the line-up as the pitching team announces what pitch is thrown. For example, if Zack Greinke throws a fastball, we look at the blue fastball number on his card and compare it to the blue fastball number on Ichiro’s card. Last time I checked, the number 96 beats the number 88 every single time. 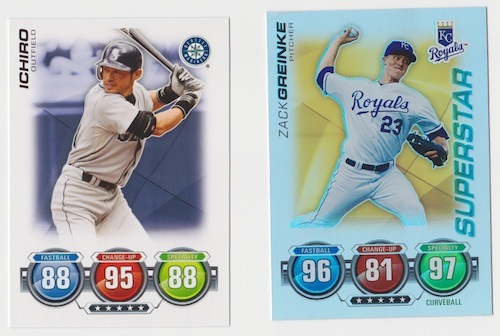 So by Topps logic, batting champ Ichiro Suzuki will NEVER get a hit off Greinke, unless he throws a change-up. With a 96 and 97 rating for fastballs and curves, only a handful of hitters could make contact off Greinke, which would give him 100 wins and a 0.32 ERA. Another asinine rule: If a batter gets a hit, it’s the equivalent of scoring a run. Topps has basically replaced America’s National Pastime with cricket. 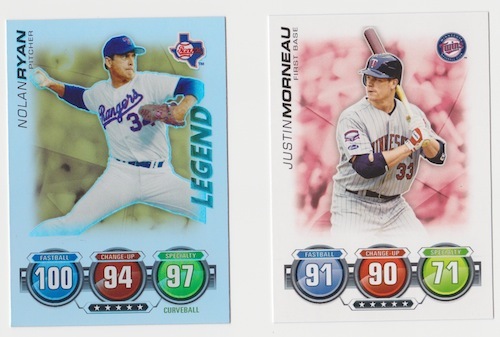 Take a look at the above fantasy match-up between Baseball Hall of Fame strikeout king Nolan Ryan and young slugger Justin Morneau, who are not contemporaries. According to these configurations, no natural fastball hitters would EVER even foul off a pitch against Ryan. The truth is that Ryan, as intimidating as he was on the mound, had a career record of 324 wins and 292 losses. Yes, he struck out an ASTOUNDING 5,714 batters, but he also gave up 3,923 hits. No one strikes everyone out all the time. Except for the Topps Attax Ryan. Which is what makes this game beyond boring. It will never come out of the box again. My kid has sophisticated tastes, but he’d also be entertained playing Hungry Hungry Hippos for three hours. If you’ve lost him, Topps, you’ve lost America. And as a guy who grew up on Stratomatic and later became addicted to Fantasy/Roto Baseball, nothing saddens me more. April 14, 2010 · 2:09 pm.04. Sucking the Joy out of Card Collecting: Baseball card enthusiasts today are more like dorky coin collectors, caring more about microscopic ink discolorations on “graded” specimens than the HR and RBI stats on the back! Do you have a secret stash of baseball cards from your childhood, either stored in your basement or perhaps even in your childhood bedroom, which your parents have left untouched since the day you left? Or perhaps you’ve never stopped collecting cards and have 3-ring binders stuffed with plastic sheets and rookie cards. Here’s the bad news. If your collection is from the 1980s or 1990s, not only won’t you be able to retire on the proceeds — you’ll be lucky to make enough to buy a steak dinner at the Capital Grille. And that’s only if you’re fortunate enough to even find a buyer. Author and Yankees fan Dave Jamieson explains why in my Boston Herald Working Stiff column this week. Although steroids and the baseball strikes have contributed to the contraction of the baseball card market, it mostly comes down to greed and overproduction — more than 81 BILLION cards were printed annually at the peak of the hobby in the early 1990s. That means that Barry Bonds and Ken Griffey Jr. rookie cards are like Monopoly money. 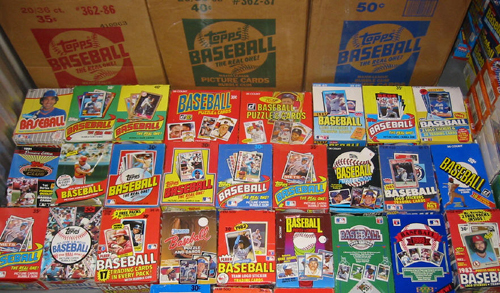 According to Jamieson, author of “Mint Condition: How Baseball Cards Became an American Obsession,” those unopened boxes you hoarded in your basement are absolutely worthless. Are 1980s and 1990s baseball cards really worthless, as author Dave Jamieson asserts in his book, "Mint Condition?" Jamieson’s book is a phenomenal primer in the pitfalls of personal investing and the dangers of believing something is valuable just because everyone says it is (see: Tickle Me Elmo, Retired Beanie Babies). 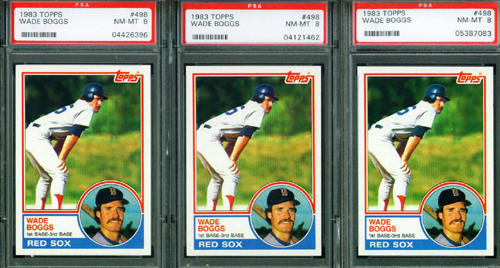 I thought my Wade Boggs rookie cards would at least fund a vacation. Maybe in his honor I could buy some chicken wings instead.